VICTORY UPDATE: August 24, 2016 - Four Paws officially closes World's Worst Zoo! 1. The zoo is located in the Gaza Strip, a place of extreme conflict. As an international animal welfare organization, FOUR PAWS is politically independent and focused on one thing: protecting animals from neglect. 2. Last year, it became public that the zoo had resorted to crudely mummifying the animals who passed away in an attempt to continue to draw visitors to the zoo so they could still afford food for the other animals. 3. 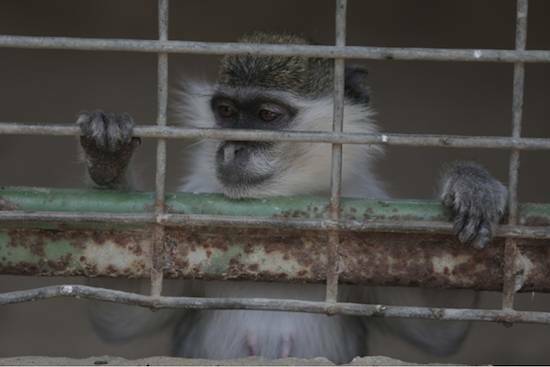 There are 16 surviving animals currently living at the Khan Younis Zoo, including 5 monkeys, several birds, a pair of tortoises and the last captive tiger remaining in Gaza. 4. After months of difficult negotiations, FOUR PAWS has been granted permission to go on a dangerous mission into the conflict zone to save all the animals and bring them to our wildlife sanctuaries, but we cannot act without your support. 5. You can make the difference for these animals. We have received over $27,000 from our generous supporters-thank you! Our work is never done: we will not sleep until we can stop the mistreatment of animals under human control, and with your help- we can! Please give today. We still have just over $15,000 to go to support our work in Gaza and around the world. Due to the unpredictable nature of the conflict zone, we may never have another chance to rescue these animals again. Early this year, financial difficulties meant that Khan Younis Zoo was no longer able to adequately care for and feed its animals. To attract more visitors and income, the owner even exhibited the mummified cadavers of animals that had already died. These ‘animal mummies’ have since been removed, but the dubious reputation as ‘worst zoo in the world’ has stuck. In February this year, the owner asked FOUR PAWS for help, and the international animal welfare organization stepped in with urgent food deliveries. In June, FOUR PAWS carried out an additional mission to assess the situation on the ground and take measures to improve it by medical checks, safety checks on enclosures, etc. FOUR PAWS had also carried out several previous missions in Gaza. Back in September 2014, a team provided assistance to the badly bombed Al-Bisan Zoo in the north of the Gaza Strip. Three lions were transferred to a rescue center in Jordan. In April 2015, a FOUR PAWS emergency relief team carried out another aid mission, giving medical treatment and food to the animals in Khan Younis Zoo. September 2015 saw FOUR PAWS succeed in extracting two lion cubs from a refugee camp. The cubs were sold as ‘pets’ to a father of six by the Rafah Zoo. FOUR PAWS is the only animal protection organization active in the region and has taken the plight of captive wild animals very seriously. Dedicated to finding a sustainable, long-term solution for all wild captive animals in Gaza, FOUR PAWS is encouraged by the closing of Khan Younis. All in all, there are six zoos in the Gaza Strip.